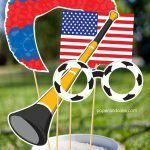 soccer photo booth props: NEW! With the countdown ON for the kickoff on June 10, you KNOW we wouldn’t let an event this BIG go by without making some Soccer photo booth props! This years World Cup is going to be held in Brazil (but, you probably already knew that), and it is going to be LOUD!